Something hot and something blue in it. I believe the artistry of Tamar Korn, Molly Ryan, Dennis Lichtman, Matt Koza, Matt Musselman, Nick Russo, Rob Adkins, and Kevin Dorn speaks for itself. Here are some notes then on the songs. Broadway’s famed Ziegfeld Follies had a fondness for musical tributes to the Big Apple (as do we, ecce signum), dating back to 1911’s New York and 1927’s My New York. Meanwhile, 1912’s That Broadway Glide was perhaps the first to encourage listeners to actually ‘do that Broadway Glide’—to dance the dance of Gotham, without getting into specifics. But in 1931, Do the New York blew them all away: listen here to Tamar Korn singing of clanging and banging, motors and machin’ry, the subway’s crash and pound, and seven million pairs of feet walking the streets. Today it’s 8.5 million, and just as the Stompers have added their voices to the mix of NYC, we’ve also added our own sounds to this song, including traffic noises and Tamar’s inscrutable and fascinating scatting. Special thanks to Lucian Cobb, of the fabulous Mint Julep Jazz Band, for his consultation on harmonizing the sound of vintage car horns! One of the great pleasures of the Grand St. Stompers is playing for swing dancers. There is simply nothing like the give-and-give of energy between dancers in motion and music in time—our mutual inspiration and communal perspiration meeting in a hot Manhattan ballroom. Swang Thang was my attempt to write, for just these nights, a riff-based swing tune in the vein of Flying Home and One O’Clock Jump, only for a group our size, a bit more relaxed, not exactly based on I Got Rhythm harmony, and with some interesting breaks and a peppy shout chorus. Though the Grand Street of our namesake is the one in Brooklyn, paired with the Grand Army Plaza, its siblings run through every borough. Ridgewood, Queens was my home for a number of years, and Ridgewood Stomp is my tribute to that neighborhood, via Louis Armstrong & His Hot Numbers (average of 6) and various other influences. It features one of my favorite under-utilized endings: the a cappella horn tag. The birthplace of this next song was NYC’s New Amsterdam Theatre, which has stood on West 42nd St. for over one hundred years. The colorful (ha) story holds that Belle Baker, one of the stars of Rodgers and Hart’s Betsy (1926), was dissatisfied with her songs in that show. Behind the duo’s backs, she (or producer Florenz Ziegfeld, depending on the account) approached her friend Irving Berlin, and had him write a last-minute addition to the show. As Rodgers and Hart sat in the audience that night in the New Amsterdam Theatre to enjoy their musical, they heard Baker sing a song they had never heard before—a song so catchy, and sung so well, that the audience immediately demanded not one encore, not two, but TWENTY-FOUR encores in a row. That song was, of course, Blue Skies, and here we are treated to two different and beautiful shades of blue with Molly Ryan and Tamar Korn. Fun Fact #1: The Metropolitan Transit Authority of NYC has a technology called Bus Time. At most bus stops, you can find a six-digit number; text this number to the transit authority, and they will reply automatically, letting you know when the next bus is not coming. Fun Fact #2: On occasion I will remember a phone number by converting it into a major-scale melody: 1 = Do, 2 = Re, 3 = Mi, etc. ; 9 = Re one octave up; and 0 = a rest. I usually find the resulting melody to be easier to remember than 10 random digits. So: The Bus Time code for the B38 bus stop near my old apartment was 504249. When converted into a melody, it happens to be an especially memorable one. Over the many occasions I waited for the bus and sung it to myself, I wound up stretching and stitching it into an entire song. Thus, 504249 represent the first five notes (plus a rest) of Ballad of Bus 38, and the motif recurs in various ways throughout. Also: The reason Ballad of Bus 38 is a ballad is because that is speed of the B38 bus. Fun Fact #3: I once told this only-half-joking story during a performance at Grand Central Terminal—part of a concert series sponsored by the Transit Authority, who of course operate the B38. Haha…whoops! That certain Manhattan block known as Tin Pan Alley gave us countless jazz tunes over decades, including Paddlin’ Madelin Home, Side by Side, What a Little Moonlight Can Do, and other songs with memorable melodies and interesting harmonies from the pen of one of their shining stars: Harry Woods. She’s a Great, Great Girl was a 1928 hit for the Roger Wolfe Kahn, Sam Lanin, and Wabash Dance Orchestras, and is no exception. Our weird ending draws inspiration from Don Redman’s arrangements, for Fletcher Henderson’s New York-based Orchestra and others, of songs such as Copenhagen. In 1926, the young songwriter Irving Kahal was performing in vaudeville sketches in New York City when he met composer Sammy Fain. From then on until Kahal’s passing in 1942, theirs was one of the most fruitful collaborations jazz has ever seen. In 1931, Kahal and Fain, together with Pierre Norman, penned When I Take My Sugar to Tea for the Marx Brothers film Monkey Business. On screen, it was introduced without vocals, but by a talented and funny Chico Marx playing a piano medley. (Would he have called it Do You Take Sugar With Your Tea?) Here Molly Ryan makes us all wish we could join tea time at the Ritz. I wrote Saratoga Serenade while staying upstate in Saratoga, NY (home of the famous racetrack) and perhaps listening to the compositions of Sidney Bechet, whose writing I quite admire. I envisioned the melody played by soprano sax, and here Matt Koza plays it better than I could have imagined. There is a melodic lineage that connects I Could Have Danced All Night, Chinatown, My Chinatown, While We Danced at the Mardi Gras, La Vie en Rose, and even Pennies From Heaven. That Disney’s Ashman and Menken used this same melodic underpinning in Be Our Guest (from Beauty and the Beast) probably evinces not only their talent for strong melodic writing, but also their appreciation of music history. This masterwork is at once a paean to and a shining example of great musical theater, and is fun as hell. I feel the spirit of this song represents the welcoming and hospitable side of New York City, with Lady Liberty lighting our gates. The Stompers are fond of throwing in the odd waltz, tango, rumba, or calypso, much as dance bands did more often in the 20s and 30s. One of our favorite options is mixing calypso and swing, and we have found that Muskrat Ramble is a particularly neat vehicle for this. What we have not found (and neither has anyone else definitively) is who composed this jazz standard, who named it, and—at least in certain circles—even what the correct name is. Composing and naming credit have been claimed by and attributed to Kid Ory (officially), Louis Armstrong, and Lil Hardin Armstrong, while Sidney Bechet claimed the song already existed in New Orleans under a different title. Finally, there was a typo on the original record, dubbing it Muskat Ramble—a mistake still repeated in some fake books today. So here is our version of a song with some title, composed by someone, and named by maybe someone else. We hope you like it. Somehow the World Has Turned Upside-Down is one of the first originals that Tamar sang with the band. It is also one of my simplest songs, and one of those I’m most happy with. That said, of course I had to go and make it perhaps too-complicated, with a modulation scheme that takes us through five keys—four different ones each a minor 3rd apart. Nevertheless, these fine gents and lady make it sound easy. The verse here was inspired somewhat obliquely by the harmonies of the verse to Bewitched, Bothered and Bewildered, while the melody owes some to my appreciation of the compositions of New Orleans clarinetist Tim Laughlin. Fun Fact #4: Sometimes Tamar takes the piss out of me (as they would say somewhere overseas) and sings the penultimate phrase as “I’ll answer in one word or two…or fourteen.” Count ’em. Many showgoers know Let Yourself Go from the musical revue Irving Berlin’s White Christmas, which was a hit at the Marquis Theatre on Broadway. It was first introduced, however, in the 1936 Gingers Rogers and Fred Astaire feature Follow the Fleet. In the film, Rogers sings it in a nightclub, backed by a vocal trio; in the following scene, to an instrumental reprise, she tap dances up a storm with Fred Astaire, sliding and kicking and landing breaks in a show-stopping number. When the Stompers perform it, it reminds us of dancing not only for this, but also because we premiered this number at a dance camp in New Hampshire many years ago, featuring Tamar and Molly singing together with us for the first time. 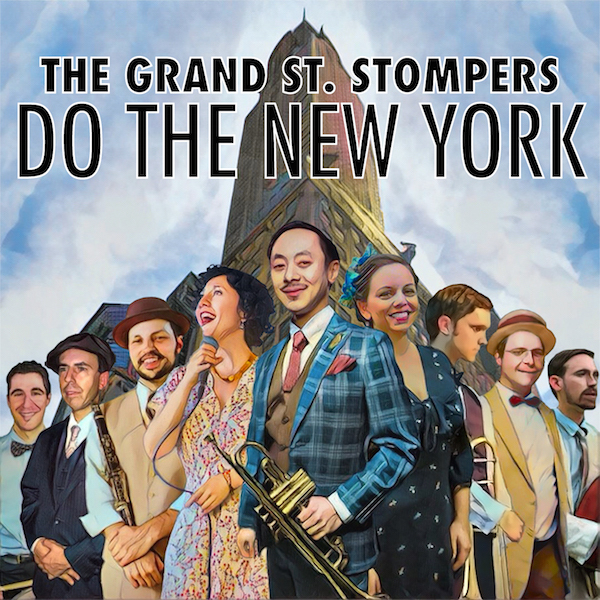 It has been a fantastic six years for the Grand St. Stompers, and we have had the pleasure and honor of sharing our music with you from coast to coast. Of course, New York City will always be our home. A deep thank you to Tamar, Molly, Dennis, Matt K., Matt M., Nick, Rob, and Kevin for their artistry and companionship over these years, and a deep thank you from all of us to you. Thank you again to Kevin & Barbara and Michael & Jazz Lives, and to many more supporters named in full in the Album Credits. Until next time…keep on Doin’ the New York.